Earlier today the Ghana U-20 national football team played their first match in the Orange African Youth Championship in South Africa, losing 1-2 to Nigeria U-20. In this post I will present all Ghana-players that are part of a team playing in the GLO Premier League. I have not written about the professionals, as they are already “discovered”, and I have not written about the players from second level of Ghanaian football, basically because it is the top level of Ghanaian football I have followed the last couple of years. James Akwasi Acheampong is one of three goalkeepers in the squad of the Cameroon U-20 national football team. I personally prefer Foli Adade but I have also seen Acheampong impress during the GLO Premier League 2010-2011. Acheampong faces tough competition at Liberty Professionals FC, competing against Daniel Agyei, the U-20 World Champion, veteran Osei Boateng and Patrick Antwi, who has one full international match for Ghana to his name. Acheampong have definitely picked up a few tricks from his more experienced colleagues as he looked very confident when I watched him in action. Acheampong has been a regular member of the Ghana U-20 national team for two years. He is a former player of Gamba All Blacks FC and joined Liberty Professionals FC in 2009-2010, playing a couple of matches in his first season. Samuel Kyere is the highly talented right-back who caught headlines when he was training with Atlético Madrid during the 2009-2010 season. Before this, Kyere had impressed for Berekum Chelsea FC during the GLO Premier League 2008-2009 and was part of the Ghana U-20 national football team during 2009. I have seen Kyere play once and he is usually a modern-style full-back with plenty of runs down the flank, basically the kind of full-back Africa has been renowned for the last couple of years. Many experts are surprised that Kyere is still in Ghana and he will be hoping for a lucrative contract in Europe after the tournament. As far as I know, Kyere has only played a few matches for Berekum Chelsea FC during the current season. To be honest, I don’t know if this is because of injury, travels abroad or simply because of the excellent form of his competitor, Eric Agyemang. The second article, from May 2009, is interesting, as it describes Aidoo as a “20-year-old”. Based on this article, as well as his footballing CV in general, I have always thought that Aidoo is born in 1988 or 1989. Nevertheless, Aidoo has been one of the revelations of the season and a key player for the current leaders of the GLO Premier League 2010-2011. Aidoo is very tough, competitive in the air and is a hard tackler. Albert Bruce is perhaps the biggest talent at Asante Kotoko FC, currently number two in the GLO Premier League 2010-2011. Bruce was one of the revelations of the season at Arsenal FC Berekum in 2009-2010 and joined top club Kotoko before the current campaign. Bruce has not been a regular player at Kotoko, but has played about 12-14 matches this season, mostly as a substitute. Bruce has tremendous potential and is a very hard-working central defensive midfielder. He need to improve his passes as my impression is that his footballing brain is sometimes too clever for his feet. I have previously written that Bruce is born 30.12.1992, a date of birth that I took from a squad list I got from the Ghana Football Association through some contacts. I have found some mistakes in this document and the date of birth 30.12.1993 could very well be correct. I have never watched Zida play and it is hard to find information about this youngster. Zida is a versatile attacker, often used as a winger. I know that he scored at least one goal in the GLO Premier League 2009-2010, but he has not scored so far this season. Zida joined Wa All Stars FC before the 2008-2009 season. The Ghana Football Association published a PDF-document at their pages in 2008, publishing information about newly registered players for the 2008-2009 season. According to the document, which I have attached, Zida is born 08.05.1992. I must admit that I did not quite understand why this player was named in the Ghana U-20 squad. I know absolutely nothing about Tetteh and he is definitely no key player at Chelsea. I think has played a couple of matches for Chelsea during March 2011 but I am not sure. According to the official homepage of Berekum Chelsea FC, Tetteh is a central defender. Saeed Adinan is a versatile defender who joined Wa All Stars FC before the 2008-2009 season. His date of birth is confirmed in the attached document found under the Seidu Shaibu Zida-presentation. Adinan was also part of the Ghana U-20 national football team during 2010 and is widely considered as a key player at All Stars. I have never seen Adinan play myself but he has a great reputation in the local football. I believe he is a full-back rather than a central defender. 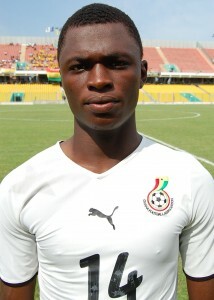 Rashid Sumaila could very well become a star in Ghanaian football during the next couple of years. Sumaila is a tough central defender who is remarkable calm, sometimes almost arrogant. I have seen him play a couple of times and he has been largely impressive. Sumaila was apparently training with AC Parma(Italy) during the 2009-2010 season. He was a regular member of Ghana U-20 during 2010. The picture is of Sumaila and is taken from Ghanasoccernet. Karim Alhassan is widely regarded as the best central defender in the GLO Premier League and the youngster has already made his full international debut for Ghana. Despite his young age, Alhassan has already captained his club Hearts of Oak SC. Alhassan has been linked to several European clubs during 2010 and 2011 many reports suggested that he had joined Polish side Wisla Krakow in December 2010. This proved to be wrong. Alhassan is solid as a rock and known for his ability to read the game. He has been a key player for the Ghana B and U-20 national football team since 2009. I liked Foli Adade immediately when I saw him play. Adade is an attacking-minded, bold goalkeeper, burly and powerful. He is the regular first choice at Ebusua Dwarfs and the experience he has gained this season will prove to be valuable. Adade is perhaps not the tallest but compensates with his jumping and technique. I have previously written that Adade is born 10.12.1992, a date of birth I took from a squad list I got from the Ghana Football Association through some contacts. Adade is also known as “Foli Adadey”. Otoo first made headlines in 2007-2008 when he was an important part of the Sporting Mirren FC side that won promotion to the GLO Premier League. Otoo was 16 at the time. Otoo scored three league goals in his first season at the highest level of Ghanaian football but his side was eventually relegated. Hearts of Oak SC had discovered his talent and he won a contract with the top club and eventually scored 10 goals during the 2009-2010 season. Otoo was soon on his way again and joined the powerful Tunisian club Espérance Sportive de Tunis on a loan-deal, which unfortunately turned out to be rather unsuccessful. Otoo returned to Hearts of Oak SC in January 2011 and has so far scored one goal in seven matches. Otoo has played matches for Ghana U-17, Ghana U-20, Ghana B and Ghana A in the period 2008-2011. He is often captain of Ghana U-20 and a key member of the team. Otoo is known for his tremendous work-rate. He likes to attack from deep which makes him difficult to pick up. He is also great at setting up the other strikers. In this article you write about a document with player dates, but I can’t find it posted, anychance you can clearyfie the link?